When considering a data center cooling device, there are many types available to get the job done. In order to choose the one to best meet your needs, you should know what each what offers and its advantages and disadvantages. Having a good cooling system is key to saving your equipment. High density in-row cooling has cooling coils and fans that draw air over the coil and put it back into the room in the form of cool air. Mostly they are chilled water that is cooled with a heat exchanger that rejects the heat. Spacing between racks is important in order to get appropriate data center cooling system. This system can take up a lot of room and use a lot of energy, but it can provide effective cooling to the area. Another option for computer room cooling is using a portal air conditioner. These devices can fit in tight, harder to reach spaces. They provide a quick solution to heating problems by cooling a very small, localized area quickly and efficiently. Often times there are hot spots in an area of the room. Instead of cooling the entire room and using unnecessary energy, portable air conditioners provide the focus needed. They create a safe environment to protect equipment and systems. With the use of programmable controls, you can easily change the settings to keep equipment cool late at night or during the weekend. The CRAC/HVAC system is another way to cool your data center. Data center cooling is the main focus when there is a lot of equipment running in one area. These rooms cannot tolerate large fluctuations in temperature at any given time. The CRAC/HVAC system stabilizes the temperature to avoid damage of equipment. Hot spots in a room can be a real challenge and pose a threat to the operation. This system monitors and maintains the temperature by equally distributing air and humidity within the data center. A CRAC/HVAC setup is replacing traditional air conditioners. They are strategically placed in the room in order to successfully cool the area. One placement is through an elevated floor where cold air rises through sections. The air flows through the racks and exits at the back of the racks after it has picked up heat. The hot air goes to the CRAC/HVAC intakes, which are usually located above the floor. This provides steady air flow in the room. Sometimes these systems are also used above the computers by taking the heat that has escaped or hovered there. To maintain an even temperature throughout the room, the system needs to address all sections of the room. Not only is it important to add cool air to the room, but also it is equally as important to take away the hot air, which the CRAC/HVAC provides. It is important to know the needs of your data center. It is also important to choose the right cooling system in order to protect the equipment. Whether you use a high density in-row cooling system, portable devices or a CRAC/HVAC system, you should know what you want to cool and what your budget allows in costs to install and maintain it. Cooling occurs close to the equipment, which is a real advantage. 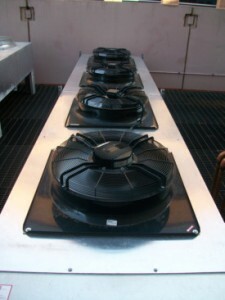 They are installed on the floor and usually suspend to provide localized and focused cooling of all the equipment. This entry was posted in Data Center Build, data center equipment and tagged Data Center Construction, data center cooling, data center equipment. Bookmark the permalink.